Bruegger’s Bagels brings fresh, New York-style bagels to nearly 300 locations around the U.S., but it’s Dan Krueger who brought Bruegger’s Bagels to South Carolina. Krueger owns multiple franchises in the Palmetto State, each one producing fresh-baked bagels from before the sun rises to the mid-afternoon. He and operating partner Tanya Springer are proud that they serve a high-quality product under a good brand, and that they’re part of the community they serve, impacting not only customers but also the lives of more than 50 employees. Brueggers’ corporate headquarters decided to no longer support the company’s outdated Windows XP point-of-sale systems. They tasked each individual franchise owner with procuring their own point-of-sale system, provided it met certain requirements. The new point of sale had to be intuitive and easy for team members to operate while providing accounting and accountability on the back end for inventory and orders. Integrated inventory was a key requirement. The old inventory system was integrated with the point of sale, but it wasn’t mobile, so conducting the weekly inventory meant going to each location, writing item counts on paper, and transferring them manually into the system. Krueger and Springer heard from a Raleigh area Bruegger’s franchise owner who was having success with Square. For their inventory needs, Square recommended its integration with MarketMan. MarketMan’s inventory management approach gives high-level insights into food costs and a better ability to predict inventory down to the ingredient level. The transition involved setting up the Square Point of Sale with menu items and entering recipes for everything in MarketMan. That way, items rung up in Square would be attached to raw ingredient items in MarketMan. Springer notes that the new integrated system allows them to do more themselves. Sales transactions sync with MarketMan, and the weekly inventory is easier than ever. Detailed order info appears on the Square register’s customer-facing display. Better data means more insights that save money and increase efficiency. 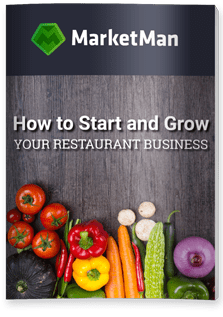 MarketMan is a complete restaurant inventory management system that integrates with Square and other popular POS systems, and bookkeeping software like Quickbooks. We can help you track your inventory and automate your accounts payable process.